We are investigating the molecular mechanisms that underlie skeletal muscle degeneration in muscular dystrophy (MD). A longstanding hypothesis in MD research is that loss of membrane integrity is a primary event leading to the degeneration of skeletal muscle fibers, resulting in the disease. In humans, a large number of characterized mutations that cause MD result from alterations in structural attachment proteins that “rivet” the underlying contractile proteins to the basal lamina, providing rigidity to the skeletal muscle cell membrane, or in proteins that directly stabilize or repair the cell membrane (such as dysferlin). Intermittent tears in the cell membrane permit an influx of calcium that functions as a primary inducer of cellular degeneration and necrosis of whole muscle fibers. 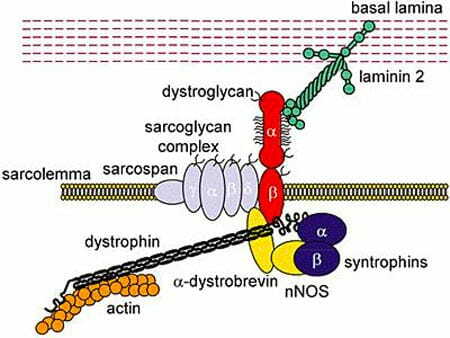 For example, the loss of dystrophin (Duchenne muscular dystrophy) or any one of the sarcoglycans leads to destabilization of the skeletal muscle cell membrane, permitting calcium influx and cellular necrosis. The laboratory is currently investigating the hypothesis that unregulated calcium entry associated with an unstable sarcolemma is a central mediator of skeletal muscle fiber degeneration and MD pathogenesis.